In the 1960’s and 70’s, the established business model for Maplewood and many older inner-ring suburbs was no longer working. Streetcars were gone. Suburban sprawl enabled by the automobile had lured away most of the customers who once supported their retail districts. to profitability several plans were floated that would make one wince today. But don’t judge these folks too harshly. They were trying to adapt their communities to this new model and they were desperate. The first plan led by the president of Citizen’s Bank, James Holton, was called “A Return to the Maple Leaf” and would have torn down everything between Manchester and Lohmeyer from Oakview Terrace to Big Bend except the new Citizen’s Bank building. Suburban type stores in a park like setting would replace the original buildings. But after “The Wedge” and a few homes were razed, outraged citizens launched a referendum and managed to halt the project. Then another group of citizens started a petition drive to allow a vote on the project and “A Return to the Maple Leaf” was on again. A short time later following the withdrawal of an important anchor it collapsed for the second and final time. A few months after this, Mr. Holton and supporters had another slightly smaller plan. This one which involved bringing a K-Mart store to downtown Maplewood would see completion. With our benefit of 20/20 hindsight, it is shocking to see what buildings were destroyed. But I’m certain the folks involved felt that without a new model they could only watch their community sink. Eminent domain was used to separate small owners from their property in order to make it available for large scale development. This is still a highly unpopular tactic as we saw during an aborted redevelopment attempt in Maplewood in 2005. Much has changed since the early 70’s. Many of the urban areas are rebounding. A couple of new generations value our historic buildings as much as ever. We can’t change the past. We can insist on the proper preservation of our historic inventory. This magnificent brick building was located at the SW corner of Manchester and Marshall until it was demolished ultimately unnecessarily in the early 70’s. 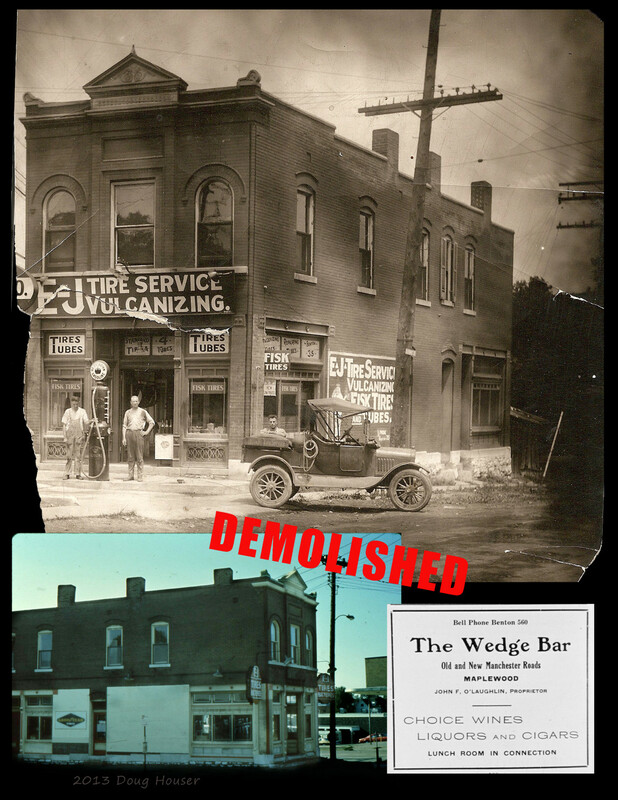 The Wedge, located at Manchester and Southwest, was another wonderful building that was demolished unnecessarily. The Swink block of retail storefronts stretched from Roseland Terrace to Oakview Terrace. 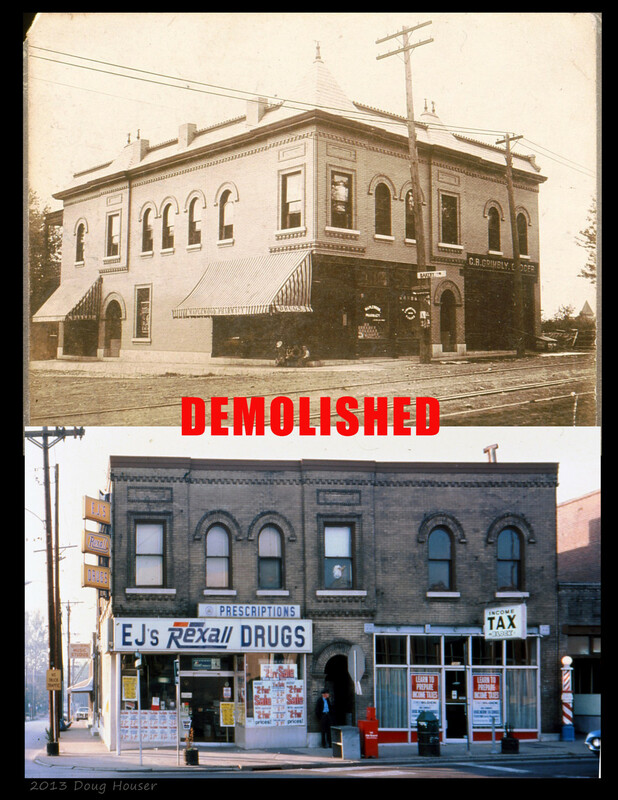 All of these commercial buildings in the 7300 block of Manchester, up to and including the bank on the corner of Sutton, were demolished for the redevelopment. Courtesy of the Maplewood Public Library. This 1946 photograph from the St. Louis Star-Times includes the Maplewood Bank on the corner of Sutton and Manchester and the buildings just to the east. From the St.Louis Star-Times and the Maplewood Public Library. Yep. Not even Eddie’s Pizza was spared. I fondly remember going to Maplewood to shop with my aunt, and went to a shoe store there in 1970 to buy shoes for my wedding., But I am confused about Goldie’s Department Store. You say it burned in the 50’s, but I remember going to a store named Goldie’s on Manchester Road in the 60’s or 70’s. Did they rebuild the store further down on Manchester after it burned in Maplewood? Hi Trisha, Golde’s burned in Maplewood in 1966. They reopened later in Warson Woods farther west on Manchester. I remember a lot of these stores in these pictures. My grandparents’ lived at the corner of Bland and Williams in Maplewood. They built the house I believe, and my dad grew up in it. Before the new garage was erected by my other grandparents who bought it from my Dad and his brother’s, my dad’s name was written in it, where he had written it as a child. I remember the long walk from down across from Velvet Freeze down all the way on Sutton into Maplewood business area as a child, and that would have been in the late 40’s and early 50’s. I even rode the old “Dinky” (streetcar) from Bruno into Brentwood, where I lived. It was sometime in the late 60’s or very early 70’s the ‘redevelopment’ which would have included a Wal-Mart and J C Penney’s was started. In the mid 70’s I worked for Citizen’s National Bank, which Mr. Holten owned. We, my hubby and children lived on Lyle Ave….up from Dobb’s, which was a Goodyear store before that. Mr. Holten was a very nice man, who had the people and the city of Maplewood’s good in mind when he working for a redevelopment of that section of property. It was Lyle and Marietta Ave from Manchester to Lyndover to the North, and from Sutton to Manchester …east to west. There was a lot of hue and cry from people in that area, and it did not go through. I think Wal-Mart decided to not fuss with the people, and soon they were building “St. Louis Marketplace”….and we all know how that ended up. I always thought it would have worked at the corner of Manchester and Big Bend. My family included five children at the time, and we moved to a larger house in Fenton. Of course the deal for our house on Lyle fell away, and we did not get the money for our house, but we managed somehow to move…..we really needed a larger house and were ready for a move anyway. I finally sold the property on Lyle in the late 90’s. I have since moved back to Maplewood, and when I moved into my little house back here, I remember feeling “well I am finally home”. It just felt so comfortable. My husband and his family lived here too….both my parent’s graduated from Maplewood-RH High in the late 30’s and my husband graduated from Maplewood in the late 50’s. So I have a lot of ties to Maplewood. It still has the ‘small town feel” to it, as far as I am concerned, and I love it. Thank you Mr. Houser for helping to keep our history alive, and I too love the pictures. Oh by the way, a picture just popped into my memory. I remember that old streetcar, when it would get to Brentwood, instead of turning around…the driver just picked up the ‘fare’ box and his seat, and carried it to the other end….and then drove it back to Maplewood. When he got to Maplewood, he did the opposite and carried his chair and fare box back to the other end. Must have really been a boring job….LOL. Pat, Thanks so much for sharing your memories with the rest of us. I would be interested in copying any photos your family might have from those days you have mentioned. 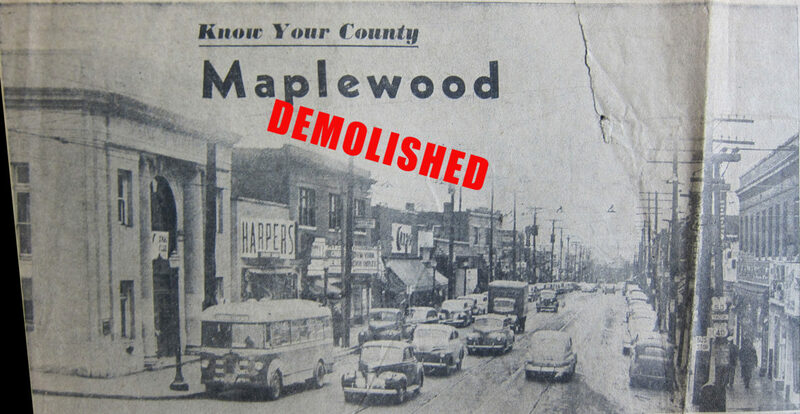 Just a reminder, everything I find or copy that is Maplewood themed goes into the collection of historic material at the Maplewood Public Library. Doug Houser, I want to commend you for your unselfish efforts in archiving Maplewood’s photos and history. Thankfully, digital technology and your efforts allow everyone to have everything. You can find treasures, restore them to the owner, and at the same time sharing/archiving them with the Maplewood Public Library system. Your efforts will live long after you. What a legacy!! High regards to you, Doug Smith, Corp Ad Photographer, retired. Doug, thanks so much. I don’t know about the unselfish part. This is an engaging hobby. Amen to the digital technology. It’s a simple matter to share these interesting photos and facts with any like minded individuals. Mind boggling really. Unthinkable just a few years ago. Your article brought back a stream of memories. My Grandparents lived on Flora and we would go to Maplewood every Friday to go to the Bettendorf grocery store for our weekly shopping. I will never forget the conveyor belt that you had to lift your baskets to the main floor to get to the checkout. My grandmother worked in the bakery for years. She knew everyone on town and it made us special. I also remember the day Goldie’s Dept. store burned down. We were so sad to see it go. Also the 2 dime stores. Thank you, M.Lopiparo. I truly enjoy getting comments like yours. It helps me to understand what life was like in Maplewood before the big change on Manchester. The conveyor at Bettendorf’s survived until 2006 when the folks with the Black Cat theater removed it. I photographed the machinery as it lay on the floor. I have a pretty good assortment of photos of the Golde’s fire too. I’ll try to run them in an upcoming post. Bill, I like the way you’re thinking. Doug – It’s crazy, I know, but do you have any pictures of the K-Mart era? I vaguely remember it, as my brother lived for a short time on Roseland when I was a teenager, but I didn’t live in St. Louis before it was gone. Ian, I do have a couple of Kmart era photos. I’ll post them soon. Supposedly there is a zoning formula that dictates the number of parking spaces based on square footage of the retail space. I was told at one point that Shop N Save had the required parking for its size. Shop N Save did at one point did apply to the P & Z to put a gas station on the front of their lot, but it did not pass. They did tryed to sugar coat it by saying they would give it a Route 66 look. I wonder, if based on the parking formula alone that it would be allowed, but that is not discussed. On another note, I was privy to some of what happen just before the K-Mart garage came down, and and say that Shop N Save did solve a big problem for Maplewood. The garage, and the storefront under the front edge were not under the same ownership. Just one of many complications. The store fronts really had no delivery access except from the street and were doomed from the day they were built. If more shops were built, the necessary delivery access would use up even more of Shop N Save parking. I cannot imagine why Shop N Save would allow it since they own the property. It seems future development would likely be on the back of the lot or front, but not both. If someday there were new vintage style buildings facing Manchester with open parking behind and where the buildings are now, that would be pretty cool. Likely to happen anytime in the foreseeable future? I doubt it. Doug, I agree. I’d love to see new vintage style buildings reflective of the originals but I know that’s a long shot. S’N’S faces formidable competition. If I’m remembering correctly they were just recently close to bankruptcy but don’t quote me on that. I don’t recall the exact details. A development to watch is the new one Wash U is putting up on the Delmar Loop. I think it’s going to have retail, housing and parking. I’m looking forward to seeing how they meld that with the existing streetscape. Really nice story Doug. I remember shopping down on Manchester as a kid and pre-teen. I bought my first pair of hip hugger bell bottoms at the Barbie Fran shop shown in one of the photos. I appreciate your efforts to keep reminding us of our past, but encourage us to look towards our future. As you said, why open old wounds. I enjoy all of your articles on the Maplewood’s history. Interesting perspective by Bill McKenzie on redeveloping the front of the Shop n Save lot. I noticed in West County they have big box stores built behind other establishments that line Manchester. I am referring to the development near 141. With proper signage Shop N Save would continue to draw customers in as it does now. I really enjoy the new 40 South News. Very readable and relative to our lives here in the South 40. Thank you for the nice words and your recollection, Cathy. I think it does no harm for folks to begin to consider what should next occupy the footprint that Shop’N’Save does now. I would hope it would strongly suggest our architecture that was lost. A people friendly, walkable type of new development there might make the area so attractive we wouldn’t be able to afford to live here. We all know we have one of the best area locations. Gary, Much thanks for putting into words what a lot of us who live here are thinking. And thank you for your compliment. Doug, loved your story. I recall shopping with my Mother in Maplewood. We would have lunch at the drug store counter. Kathy, Thanks for your comment and recollection. Do you remember which drugstore it was? Love the pictures Doug. 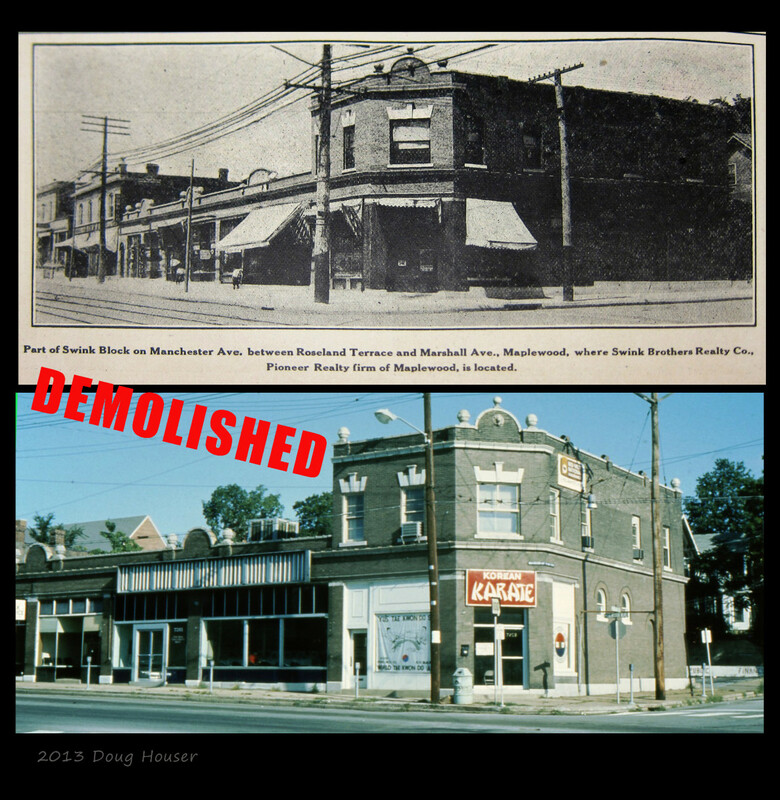 Maplewood is so lucky to have a history lover such as yourself renewing community pride and a desire for preservation. Thanks, Kathy. It’s awfully nice of you to say that. Thanks for your comment, Brenna. Maplewood is ascendant again. Sure we lost some neat places but we’ve created a lot more to replace them. Tell your friend who used to live here he needs to return. He’ll find much to like these days not just downtown but all over Maplewood. Do you have any information about the faint signage on the East side of the building the houses Tiffany’s Diner? You can see it from across the street. I can make out words like, “brushes”, “knives” and a few other words that suggest a hardware store. I ask Bob Scheidt if he knew what it referred to but he said he didn’t know. He must have done well because he later built the three story building just a few doors west that bears his name in terra cotta. I absolutely love your posts about historical Maplewood and the photos. Do you have any photos of Cherry Ave.? Patty, thank you very much for your comment. The only thing I could offer you about Cherry Ave. would be the portion of the 1909 map which shows which buildings were there at that time. I regret I haven’t seen any historic photos of any of the homes on your street. Contact me at dkhouser@gmail.com and I’ll send you the map. Thanks. Excellent recap Doug. The stories I had heard about Holton were far less kind. More like an assault on Maplewood. A big windfall for him because of reevaluation and loss on paper to his advantage. Gossip, I suppose. I am sure he was only working for the good of Maplewood. Yeah right! I always appreciate your comments, Doug Smith, prominent area photographer and long-time Maplewood business person. I did my homework on this one, that is I consulted my own book, “the first one hundred years, Maplewood, MO” (I know, I know. It’s not capitalized on the book either. Damn you, cover designer!). I don’t doubt that there is some truth in what you say. As one would expect the reactions were across the board. Elmer Wind Jr. once explained it was necessary for his family to sell the Wedge in order for the money to be divided amongst the family. Opposite that was Harold Seliga, owner of Seliga Shoes who said in the Post-Dispatch, “I am stabbed…I am bleeding…I never received my day in court”. Many residents lost their homes. The resulting backlash recalled the mayor and wound up transforming the structure of our government from the commission form to the charter form. Holton was a businessman and no doubt behaved accordingly. However in our book, my co-author, Joyce Cheney, writes, “Some of Holton’s arguments in favor of his proposal turned out to be decades ahead of their time.” Holton said his project spoke to “the current national need to conserve energy and renew interest in our fine urban areas”. It is a shame that the tax structure then as well as now makes it necessary for communities to include the very large, big box stores which generate revenue but are no more aesthetically pleasing than the giant parking lots that are inevitably in front of them. Thanks, Doug, for your research, insight and expertise. I’ve come to love this town and I am always hungry for information about our common inheritance coupled with our own duty to future citizens. To your observation about tax structure I’ll add one of my own: City cash flow is not entirely at the mercy of tax revenues. It seems to me that all cities tend to make the same mistake: when times (and revenues) are good, they spend on long term recurring commitments that aren’t easily reduced when revenues diminish. How many cities do you know of that have anything like a substantial rainy day fund (I’m talking about 1-2 years of monthly operational reserves)? Most that I’m familiar with literally spend paycheck-to-paycheck. Then when revenues shrink for whatever reason, the only solution they then have open to them is to go begging after supplemental sources of revenue. Like payday loan services, the Big Boxes are then more than happy to offer terms that will ease the pain in the short term, but are disastrous in the longer run. Neither individuals nor cities are helpless in the face of unpredictable economic fluctuations, but they both must engage in sound fiscal practices to avoid being forced into poor choices with little or no control. The destruction of the North side of Manchester was driven as much by bad management as it was greed. Desperation always plays right into the loan shark’s hands. Again, thanks for the wonderful stories about our history! Keep ’em coming. William, I appreciate your input very much. The value of a blog such as this is that we can all learn from each other…unfiltered. (Well, I haven’t yet had to filter anyone). What you say makes sense. I wonder if our own community has a reserve like the one you mention. I hope so. Greed and bad management may have played a role in the destruction of part of our historic core but I don’t have evidence of that. My intention is not to open old wounds but to make folks more recent to the community aware of what happened. And to make everyone aware of the important buildings we lost in the hope it will make them more determined to keep the ones we still have. I do know that the loss of population and subsequent loss of revenue faced by cities and municipalities around the country, caused by the automobile, was unprecedented. I know they were struggling with how to deal with this new lifestyle. Mistakes were made. Perhaps what happened here was one or was the revenue from the Kmart worth the loss of historic buildings? I hope not. What is done is done but what should we do next? We were stuck for a while with a giant crater in the heart of our community filled by a much hated rickety Kmart building. 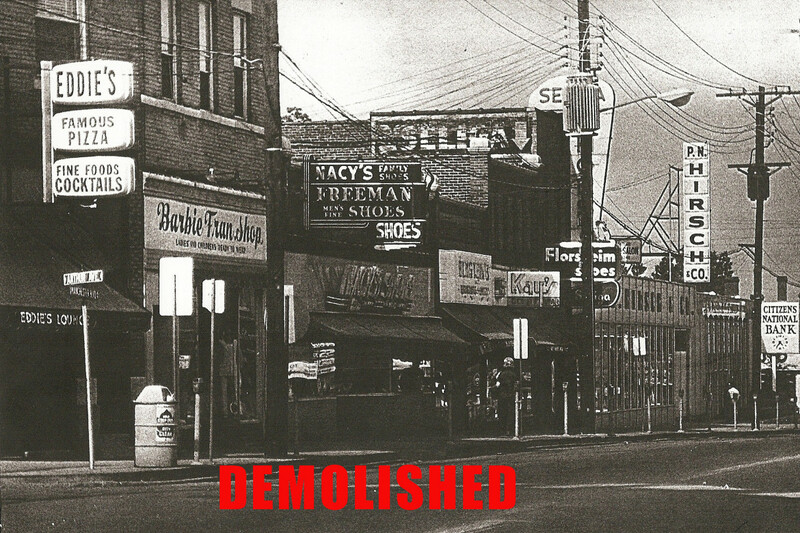 Shop’N’Save is regarded as a savior by many of us because they demolished the Kmart building and garage. S’N’S is a big box store more suited to “out by the highway” than in the center of a historic community. None-the-less it gives me pleasure to see it because I remember so well what preceded it. I’m still grateful to them. When Shop’N’Saves time is up, what next? Is Shop’N Save’s parking lot ever full? It is enormous. Why not rebuild? New retail/entertainment could be built along the north side of Manchester and still leave room for a large parking lot for Shop’N Save. There is such strong demand for retail space by small business operators in Maplewood that new storefronts would most likely be filled in no time. The atmosphere of the block and the entire area would grow in charm. Our predecessors built the buildings we love now. Surely we can do the same.